The marriage proposal sets the stage for the happiness and promise to come. All proposals should be memorable, a surprise and most definitely romantic. Asking someone if they'll spend the rest of their life with you should be the most important question of your life. How you propose, where you propose and what you say will be a story that will follow you the rest of your life, told and retold through the years, so make it a memorable story to tell. First things first. It is the custom and also respectful to ask your future bride's father for approval before whisking his daughter away. This act of thoughtfulness will never be forgotten and will create a close relationship for the future. Proposal ideas are endless; in fact, they are only limited by the extent of your imagination. Be creative. Take this opportunity to shine. Your proposal should be a reflection of you and your bride-to-be. Make the moment unforgettable. Try to tie her hobbies or interests into the proposal or something you enjoy doing together like traveling, hiking etc... Choosing a place that will always be there to visit again is always a good idea if possible, such as a historic place, park or famous location or restaurant. In an intimate setting, preferably one with family and friends waiting nearby, drop to one knee and let your heart do the talking. Many cities offer this romantic escape, most notably the historic squares of Savannah, GA to the excitement of Central Park. Hide a bottle of champagne, bring glasses and don't forget your camera. Again, many cities both large and small have wonderful parks ideal for snuggling together and finding the perfect moment to express your thoughts. Everyone loves the beach. Take her for a long walk on the beach, when the time is right, find a special place to stop and express your wishes. Or come upon a proposal written in the sand. Or, find a message in a bottle with your sentiments enclosed. Take her out to your favorite Chinese restaurant. Arrange for the waiter to present the special fortune cookie, with your message, to your sweetheart after the meal. Imagine her surprise when she cracks open the cookie and reads her "fortune". Make a time capsule, any unique container will do, with mementos of memorable occasions spent together and at the bottom place her engagement ring as a summation of your wonderful life together and the one yet to be. Have some fun. Visit a fortune teller, that you're in cahoots with and let her predict the future. You will be in a position to confirm it sealed with the ring and a kiss. Ask a local museum if they would put the ring on display with a display card reading that this was the very ring used by you on that particular day to ask her to be your bride. A loving new pet or an old family member are both a sure hit. Her beautiful new engagement ring hanging from the collar will certainly surprise her when she least expects it. Set up the screen saver to be the proposal, and be there when it pops up. Think about the JumboTron at a professional sporting event, a plane trailing your proposal, an intercom on a commercial airplane, a billboard on her route home from work...the more witnesses the merrier. If you're brave, arrange for a local movie theater to play a video tape of you before the feature, telling her how much she means to you and asking if she'll marry you. 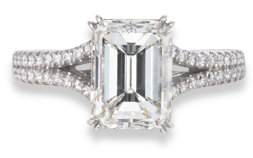 In front of adoring fans and your family and friends hidden in the crowd, present her with the ring. There are a thousand ways to propose. But the best proposal is the one that is the most meaningful for the two of you. Toast your engagement with a night on the town, a glass of bubbly or a celebration with friends and family. And whatever you do, don't forget your camera.